An excellent integrated amplifier with a marvelous sounding phono section too! 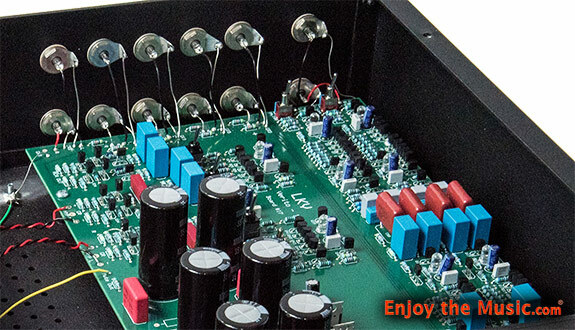 Back in August of 2013, I was lucky enough to review the first component LKV Research manufactured, their 2-SB Phonostage, which impressed me enough to nominate it for an Enjoy the Music.com's Best Of 2013 Blue Note Award. In October of 2014 I reviewed the LKV Research Line One Preamplifier, which also impressed enough to nominate this component for a 2014 Blue Note Award. In both reviews, I wrote that their level of transparency, and even more so, their musicality, makes both very commendable products, and very easy to recommend because the level of performance one enjoys is way beyond what anyone should expect from components at these prices. And now, after all these accolades, head honcho and chief designer of LKV Research Bill Hutchins has taken his next step, and has introduced his Verito 1 Integrated amplifier. To say that my expectations were high when I received the Verito 1 integrated amplifier is an understatement. And why shouldn't I have been enthusiastic about this component? This integrated amp contains what LKV Research calls "the best" of the circuitry and internal parts of their Line One preamp and Veros One phono stage with a 180 Watt per channel power amplifier that uses Hypex Electronics highly-rated NCore technology. I have previously had in my system Class D power amps that use this NCore technology, namely Merrill Audio's Thor and Blue Note Award winning Veritas power amps, and both of them impressed me enough that I practically cried when I had to return them to the manufacturer. And this bodes well for this LKV Research integrated amp that uses similar technology. LKV claims that they can achieve their high level of performance in their preamp section of the Verito 1 because they use a Class A differential amplifier circuit with discrete bipolar transistors, hand-matched JFETs, and what LKV claims are excellent passive parts that are included in the signal path with 1% tolerance metal film resistors and polypropylene capacitors, and uses no loop feedback. My sample of the single-chassis Verito 1 has the optional phono stage that can not only accommodate moving magnet (MM) phono cartridges, but also moving coil (MC) cartridges (most integrated amps at or around the Verito 1's price usually only contain a MM phono stage). In LKV Research head Bill Hutchins's words, "An integrated amp with aspirations to the top of the high-end performance tree had to have an MC-capable phono stage". The LKV Research Verito 1 is configured so one can use it as a stand-alone phono preamp, but additionally as a linestage preamp that controls the volume and selects the source. The Verito 1 comes standard with five unbalanced RCA inputs, and one pair of RCA outputs. The Verito 1 is housed in a single chassis that looks very similar to other LKV components. It's a very simple, understated design. On the front of the black cabinet is a single toggle switch that changes the amp's status from standby to on. There are two large silver control knobs; one is for volume, the other for source selection. On the unit's rear panel there are five unbalanced RCA inputs, a pair of unbalanced RCA outputs, an IEC receptacle for the power cable of your choice (a standard cable is provided). I first used the Verito 1 within my second system that's located in a common space in our home. The speakers in this system are the two-way floor-standing EgglestonWorks Isabel Signature. These medium sized speakers are relatively easy to drive, mostly because of their very stable 8 Ohm impedance. Sources were digital, with silver discs spun on an OPPO BDP-83 Special Edition universal disc player. Currently, the strong point of the digital-only front-end is the Gold Note DS-1000 streamer/DAC. It is an excellent sounding DAC made in Italy that can read files off my home's Wi-Fi with extremely low levels of sound quality lost when compared to playing the same program off a hard-wired connection to one of its digital inputs. It's quite a unit, which I'll review soon. When I brought the Verito 1 upstairs to my main listening room, I brought the DS-1000 with it. Of course, I also have in this system my analog front-end, which because of its superior sound quality assisted in getting an even clearer sonic picture of the character of the Verito 1, including its phono stage. The EgglestonWorks speakers in the other system are not slouches, but the Sound Lab Majestic 545 electrostats in the main system are much more resolving. I won't beat around the bush, the LKV Verito 1 integrated amplifier is a fantastic piece of high-end gear. The Verito 1 exhibits all the qualities that I've come to expect from a component designed and built by Bill Hutchins. When used in my second system as an integrated amp feeding the EgglestonWorks speakers, it was as if I've upgraded to a speaker higher-up in the EgglestonWorks line. Never have I heard a deeper, more pitch stable and stentorian bass coming forth from these relatively small speakers. The midrange was reminiscent of the similarly powered Merrill Audio Thor amplifiers that I auditioned two years ago. The midrange of the Verito 1 reproduced music as transparently as I've ever heard from a component anywhere near this LKV Research component's asking price. Better yet, it was free of any anomalies that I was forced to become accustomed to in the dark-ages of early Class D components. I can only chalk that up to the Verito 1's Class A preamp stage combined with its Hypex NCore Class D power stage. In my listening notes, I would search for descriptions of the quality of the midrange of the Verito 1, but would only be left with a description of the quality of the recording I was listening to. We all have our go-to recordings to either test or demonstrate our systems, but again, this exercise was only a demonstration of the prowess of the recording quality of the demo disc or files. No, the midrange wasn't "perfect". This was made clearly evident when I used the Verito 1 in my main system, where I use some much more expensive equipment to feed my Sound Lab speakers. It was no surprise that I didn't hear sound as good as when using a $25,000 power amplifier. But judged on its own, and especially when judged against comparatively priced components, the Verito 1 proved that it could hold its own. 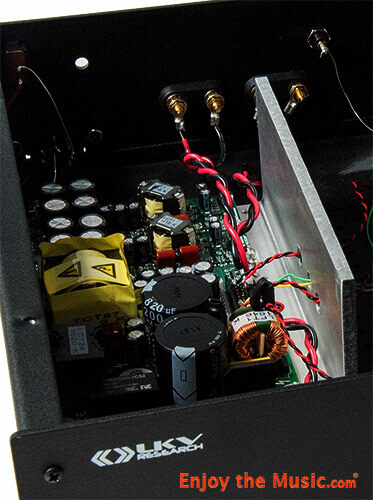 I'll be honest, though -- I had no other mid-priced integrated amps in my system at the time of the LKV's review, but I've heard more than my fair share in the past � and none of them impressed me as much as this average looking LKV Research integrated amp. 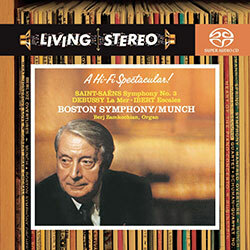 More than once I played one of my favorite versions of Berlioz's Symphony Fantastique, Charles Munch conducting the Boston Symphony Orchestra from an RCA's Living Stereo series SACD transfer. In parts of this tone poem the orchestration can get extremely boisterous and complex, but the first few more introspective movements really showed off the Verito 1's midrange prowess, as the strings were simultaneously lush but natural sounding. The intense "March To The Scaffolds", the fourth out of the five-movement opus, is a test of just about every audiophile quality that a component can be forced to demonstrate. The Verito 1 was able to let the music that was so expertly recorded pass through to my speakers unadulterated (along with a good amount of tape hiss). Along with feeling that the Verito 1 was extremely musical sounding, making each instrument or group of instruments sound as lifelike as they possibly could (which was also due to the front-end that was feeding it), from the sound of drumsticks hitting the rim of the snare drum, to the clarion horns during the climax. Nearer to the beginning of the movement, a bassoon is scurrying along playing sixteenth notes. Following this instrument was made extremely easy due to the Verito 1's ability to create a pin-point image, located half-way between the podium and the double basses, in the middle of the section. During my early listening sessions, I didn't think of the Verito 1 as possessing "pin-point" imaging properties, I just heard a bassoon playing. How many times have you attended an orchestral concert and exclaimed "the pin-point imaging was fantastic!"? None, I suppose. The sound of the bassoon was covered up a bit by the lower strings, but not only was its location easy to find, but also its timbre was extremely easy to discern, which added so much to the narrative of the drama unfolding. It also made me feel the joy of having a high-end system that can separate the instruments in such a musical manner. I feel lucky that I've acquired a nice sized library of DSD (SACD) files on my hard-drives that are connected to my music server. Many are files ripped from the discs, which can be single layer SACDs that were made in Japan. 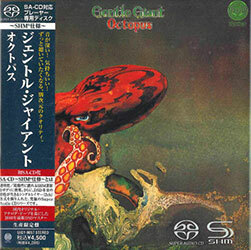 One of these albums is the progressive rock gem Octopus by the British band Gentle Giant. As a kid in the mid-1970s I was lucky enough to attend a Gentle Giant concert when they were on one of their few US tours. Ever since I saw this band play live their music has been more than an occasional guest on my turntable and music server, including this album. Gentle Giant consisted of six multi-instrumentalists and vocalists, who took turns leading this equalitarian outfit, one of their goals being to sound as non-commercial as possible. Even first-time listeners will attest to their success at doing this, although these days it's easy to guess that the sound coming from the speakers is early-1970s British prog. Any album that has a song with a complex, madrigal-styled tune with its lyrics inspired by R.D. Laing will find itself in no other bin in the record store but "Prog". The transfer of Octopus' master-tape to this SACD seems nearly perfect, as the difference between these files and my UK pressing on LP are different only in the plus and minuses of the format playing and the component that is reproducing it. The LKV Research Verito 1 manages to take from my DAC's output and transfer the signal to the speakers a sound that I can best describe as musically muscular. The low-frequency sounds were rendered with a stentorian grip, and at the same time the Verito 1 injected little of its own sound into the music that I was enjoying. And I enjoyed it very much, mostly because I felt as if the Verito 1 was trying its best to become the proverbial straight wire with gain. But, for some reason I was surprised at the amount of gain I was getting from the Verito 1. At 180 WPC, this is far from a low-powered unit, but I could swear that it was behaving more like one that had 250 Wpc, or more. When in the big rig in my main system which uses quite large Sound Lab full-range electrostatic speakers, it had no problem driving them to a volume that was more than satisfying, and with a quality that rivaled the best integrated amps that I've ever had in my system. I'll take a moment to clarify that last statement � I've had in my system integrated amps costing as much as ten times as much as the Verito 1. No, the Verito 1 did not sound as good as those extremely expensive integrated amps. But the Verito 1 did sound better than any integrated amp I've had in my system that was anywhere near its price, and while I was listening to music with the Verito 1 in my system, I didn't yearn for one of these upscale integrated amps. On the Gentle Giant album, the Verito 1 reproduced all the instruments and vocals with an extremely lifelike sonic disposition. It was easy to hear that the vocals were on different tracks from the instruments, and there was enough air around them to tell that they were likely recorded in an isolation booth. But with this band it's the instrumentation that enthralls me. Only a partial list of the instruments taken from the liner-notes on the album are sax, trumpet, mellophone (a middle-voiced brass horn that was mostly used in marching bands and bugle corps), vibraphone, different types of percussion instruments such as conga and a full drum kit, bass, violin and guitar. As prog rock is wont to do, sometime the music gets rather complex, yet the Verito 1 was always able to sort out all the instruments and voices, and place them within its huge soundstage that extended well beyond the surface of the speakers. On the track "Knots", a cappella vocals start things off, but are soon joined by an atonal riff on the vibraphone. Even though I've heard this album thousands of times I nearly jumped out of my seat when the full band enters during this intro, at least letting me know that this integrated has no problems in the macro-dynamics department. This is a very typical Gentle Giant composition, in that they rarely let a groove take hold before they inject some complex vocal or instrumental gymnastics. As the vocal harmonies floated between the two speakers, they were surrounded by instruments that seemed to engulf me in sound. I also used the Verito 1 as a stand-alone phono preamplifier. I doubt that anyone would purchase this integrated amplifier to use it in this way � what a waste of a great integrated amplifier -- but I used it this way only because the instructions on how to use it in this way are in the manual. My description of the sound quality of the phono stage of the Verito 1 is from using it both ways � as a stand-alone phono preamp, and simply connecting my turntable into the Verito 1. I have more than a bit of experience with LKV Research's phono preamplifiers, having reviewed their first phono preamp, the 2-SB, back in 2013. But in their literature, they say that the phono section in this unit is "derived" from their higher priced Veros 1 phono preamplifier. I'm spoiled, as my reference phono preamplifier is the Pass Labs XP-15, which originally sold for almost a third more than the entire Verito 1 integrated amp. But I didn't compare these two directly, that wasn't the point of checking out the phono preamp when used with the Verito 1 or the Verito 1's phono section alone. I wanted to hear how the Verito 1's phono preamp stacked up against my memory of LKV Research's own phono preamplifier, and just for fun, really. In a word, the phono section of the Verito 1 is outstanding! When using it as a stand-along phono preamp, perhaps because of not only the Verito 1 not using an outboard power supply, and the fact that the internal power supply of the phono preamplifier shares this internal power supply with the rest of the integrated amp, when using it this manner the phono section didn't seem as ballsy as my memory of the LKV Research phono preamp I reviewed. Sonic memory being what it is, I'm not prepared to make a specific statement of the difference between the 2-SB phonostage that I reviewed more than four years ago and the phono section of the Verito 1 when used alone, but still, I thought the phono preamp in the Verito 1 when it is used in the way that it was designed for was much better than what I expected. When playing records with my turntable hooked up to the Verito 1's phono input, and used as an integrated amp, my comment about the phono preamp not being "ballsy" was null and void. I don't think there will be many, if any, complaints about this marvelous sounding internal phono section. For a measly $500 tacked on to the price of Verito 1, this phono stage has everything that one could want in an affordable phono stage � plenty of quiet gain, a level of transparency that can be compared to phono stages that cost much more, and exemplary sound in its frequency extremes. The higher treble of the Verito 1's phono stage is excellent. Often this is where I feel that some inexpensive phono stages falter. Even though the Verito 1's phono stage's treble can't compete with the big boys, it doesn't commit any horrible errors of omission or commission. When the highest treble is tested, such as when a crash cymbal explodes on a Who LP, the phono section very slightly rolls off the splash of the cymbal. But I've heard many inexpensive phono stages that make cymbal crashes sound more like aerosol spray-paint cans than cymbals. Through the LKV Research Verito 1's phono stage a cymbal sounds like a cymbal, thank you very much. The bass of the phono stage has excellent extension. This bass on some very inexpensive phono sections make every bass instrument sound alike, so much so that it makes it difficult to distinguishing a synth bass from a bass guitar. The Verito 1's phono section is light-years better than that. I have a strong feeling that this is due to the phono signal being fed through the Verito 1's power amp stage. Its bass is tight sounding, and quite pitch specific. 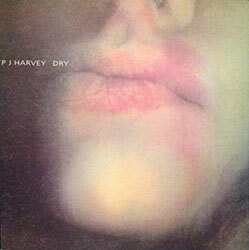 Mids of the phono section are crystal clear, as admirably demonstrated when I played my vinyl copy of PJ Harvey album "Dry". The vocals sounded very close to what I was used to hearing from my reference. As with the bass and treble, it was its definition that was most impressive. The crystal-clear reproduction of a woman singing into a microphone was what I heard when playing this album, plus there is the benefit of this phono section not blurring the transients, and its ability to separate the sounds on the record, so when the band behind her was making lots of noise her vocals weren't buried beneath it. OK, I'll now admit that it is a little weird testing a $500 phono stage with the Italian made $8000 Gold Note Tuscany phono cartridge, but at least I can't blame my analog front-end for anything that was wrong with the phono stage! And the phono stage of the LKV Research is a surpassingly good performer, and again, a bargain. I also tried using the Verito 1 as a preamplifier. I did so only for a short time, as I couldn't imagine one purchasing this integrated amplifier to use it in this way. Still, doing so gave me a good idea what the preamp-stage of this integrated amp would sound like if I connected it to a reference quality, 350 Watt per channel class A/B amplifier, namely my Pass Laboratories X350.5 power amp. It surprised me not one bit that it was a solid performer. Frankly, using the Verito 1 as a preamp in my reference system didn't blow me away, I'm going to blame that on the fact that I'm quite accustomed to using much higher caliber preamplifiers than the one built into the Verito 1. But I certainly wasn't disappointed in its performance; mostly due to it not messing with the analog or digital front-end signal too much. Its sound was more light-weight than my current reference preamplifier that cost almost five times as much as the Verito 1. Nevertheless, the Verito 1's preamp section proved that it could pass the signal mostly unadulterated, without adding much sound of its own, other than a bit of frequency extreme cut-off, which again, was only made apparent if I compared it to my much costlier reference. What the Verito 1 preamp-stage did sound like, was as if I put a well-built, affordable, Class A preamp into my system, as it didn't muck things up with any additive sounds that would distract from the music. In fact, it was a rather musical sounding preamplifier. I played Shostakovich's String Quartet No. 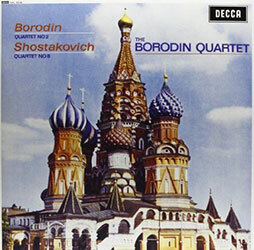 8 as played by the 1962 version of the Borodin Quartet on London Records. I could still hear the rosin-y sound of the bows connecting with the violin strings, I could still hear the ambience of the room quite well, and I could still enjoy this master-work to the fullest. Bill Hutchins of LKV Research should be awarded for designing and building the Verito 1. It is a fantastic sounding integrated amp that is well worth its asking price, and beyond. If one uses a turntable as part of their front-end, it would be foolish not to include the phono section that is offered for a mere $500 tacked onto its price. Even straight out of the box it was easy to hear that the Verito 1 had a mighty sounding Class D power amp section, as it nearly knocked me out of my listening seat when I played my first selection. 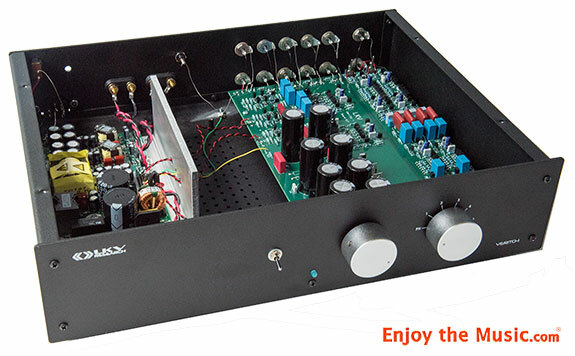 Class D amplification has come a long way since it was first introduced into high-end power amplifiers, thanks in most part to the Hypex NCore technology that LKV Research wisely incorporates into its power amp section of this integrated amplifier. LKV Research's Verito 1's five inputs, smooth operating volume control, and especially its phono preamplifier, place this component on the top of my list of integrated amps that I would recommend. The Verito 1 costs $2700 with a phono stage, and $2200 without. The Verito 1's only flaw is that it does not have a remote. But unless one is incapable of walking across the room to change the volume control, this is the integrated amp to get if looking for an integrated amplifier anywhere near its asking price. To be truthful, I'd include this integrated amplifier if someone were looking for an integrated amplifier at twice the price. Honestly.